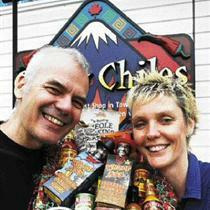 Rob Myers and Alison Steele-Myers at their Chilly Chiles store in Navan. What did you do? I went Christmas shopping and brought back treasures from Indonesia, Alsace, Guadaloupe, South Africa, Kenya, New Mexico, India, B.C. and the Canadian arctic. Wow. That must have been some trip. How long were you gone? About four hours. Get out of town! No, that's just it -- I didn't leave town, unless you count the 20-minute drive to Navan. So how did you get all this worldly stuff? Ottawa has an unusually good selection of stores that import from places around the world, including many Third World countries. As the shop Ten Thousand Villages says on its front window, Fair Trade can mean "dignity, sustainability, education, hope and fairer world." OK, at what store did you start? Actually, not a store at all, but a suite in the Minto Suites Hotel. Two local women with backgrounds in international development and eyes for the exotic rented a suite and set out silk scarves from Thailand, carpets from Kashmir, vases from Bali, pyjamas from India and silver jewelry from Indonesia. Anything there for my sister who travels a lot? How about a lovely silk-and-cotton patterned robe that comes folded up in its own envelope-like pouch? They're handmade in India and cost $89.99 each. But was this a one-time sale? They're doing it again next weekend, Friday to Sunday. Call 613-236-0241 or e-mail abacus.trade@gmail.com for more details. Did you came across anything slightly less expensive that would make a good hostess gift? How about some ice-wine glazed smoked salmon? It comes from Saltspring Island and costs $13.98 at Canada's Four Corners, on Sparks at Metcalfe. They also carry this product at the Boutique at the Museum of Civilization. Is that a good place to go gift shopping? Absolutely! The museum boutique has gorgeous scarves by artists from across Canada -- from shiny, crinkly ones by Wilma Butts of Halifax to native print ones by James Hart from Haida Gwaii. (Ties too for Dad.) Prices range from $45 to $250. But there's lots of less expensive stuff, such as Labrador and Inuit tea, chocolate made with lavender from Quebec and dreamcatchers and jewelry. Isn't that where the children's museum is? Yes, and it has great gifts for kids -- from temporary tattoos with patterns by native artists ($1.50 to $3) to build-your-own inukshuks in a bag ($9.99) and build-your-own log birdhouse kits for $27.99. What about something to take to a family sleigh-ride party? How about a colourful bag of hot cocoa mix from Guadeloupe, a French island in the Caribbean noted for its cocoa and sugar. It comes in flavours such as mint, orange, hazelnut, Inca or even a special Christmas mix. Perfect -- where can I find this? Made in France, on Dalhousie Street between Murray and Clarence. It's $12.50 a bag. Anything else you'd recommend there? How about some cranberry sugar to rim your Christmas cocktail glasses? The same company that makes the cocoa mix also makes bags of flavoured sugars. Bags of gingerbread from Gertwiller, in Alsace -- known in France as the town of gingerbread -- would also make great hostess gifts. I bought a $7 bag of hazelnut gingerbread with chocolate drizzled on top. Not sure it will last long enough to get to any hostess. As long as I'm in the Byward Market area, are there other stores you'd recommend for exotic gifts? Many -- but Giraffe, at 19 Clarence St., really stands out. As soon as you enter, the African beat seems to warm your spirit. You might choose a $3.95 bamboo whistle from Cameroon for a child's stocking, a gorgeous painted plate from Morocco ($19 to $50), Maasai jewelry or beautiful rosewood salad servers from Kenya, with zebra, impala or giraffe heads on top. I'd like something colourful, cheap and cheerful ... Then look no further than the papier-mache bowls made of red, white and silver sardine-tin labels. They're inexpensive -- $12 for a fruit bowl -- and made by Wola Nani, a non-profit group in South Africa that's aimed at bringing relief to communities hardest hit by AIDS. Wola Nani is a Xhosa phrase that means "we embrace and develop one another." What about unusual Christmas tree ornaments? For a real cross-cultural tree, try Tibetan-style Buddha ornament. You can get them for $6.95 at Masala, at 17B York St. In Westboro, Ten Thousand Villages has dozens of baskets of beautiful metal snowflakes, corn-husk angels and metal woven stars. Most are $3 to $5. Isn't that near Bridgehead? Right across the street. Stop in for a fair-trade coffee and pick up a bag of nut brittle or sweet and spicy holiday nuts for $6.50 while you're at it. They'd make great gifts for office mates. Speaking of food ... I have a friend who's a gourmet cook, with a particular penchant for the hot and spicy. Chilly Chiles, formerly of Sussex Drive, has moved back nearer the owners' home in Navan. The 20-minute drive takes you to sauces and spices from the Caribbean, Mexico, Colombia, Tunisia -- even Saskatoon, where someone of Indian descent is making excellent curry sauces. "Almost everything we carry is not commonly available," says head chilihead Rob Myers. Something great for less than $5? How about a bag of authentic chili powder (most grocery store versions contain fillers such as salt and oregano). Chilly Chiles has all sorts, but for a real gourmet go for the dark, rich chili powder from Chimayo, New Mexico, $4.95 a bag. Other great gift choices include Spanish smoked paprika ($5.95), Chilly Chiles' own black bean chili mix ($6.50), Alison Steele-Myers special rub for ribs, steak or lamb ($6.95), as well as flavoured popcorn, hot nuts and even chili-infused gum and lollipops.